The Beatitudes are the blazing heart of everything Jesus taught. Once you’ve got them, once you’re living them, then you’ve begun to “get” Jesus and the way he thinks. And I am only beginning to! For the Beatitudes to travel the longest journey in the world, from the head to the heart, is a life-long endeavour, a matter of stumbling, and getting up again, and I am just learning. I am a disciple, learning cognitively, emotionally, and experientially. Mercifully, however, the Beatitudes are not ontological statements of reality. It’s not blessed are the beautiful; blessed are the brilliant; blessed are the bronze-skinned, which you either are, or are not. Instead, it is blessed are the meek; blessed are the merciful; blessed are the pure-hearted, and these are things we choose to be and become through a series of noble choices. We become gentle by choosing gentleness, again and again. We become merciful by choosing to be merciful, again and again. We develop the purity of heart which helps us see God by repenting of our sin, again and again. Tiny step by step, we inch towards promised land where the meek inherit the earth, and we are shown mercy, and we see God. 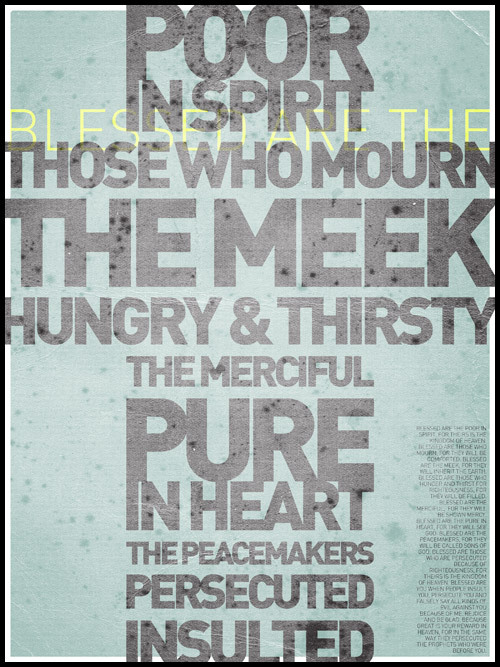 How practically do we enter the blessedness promised in the Beatitudes? I guess it’s behavioural modification. If we are not merciful, we behave as if we are merciful. If we are not meek, we behave as if we are meek. Blessed are the merciful for they shall be shown mercy, Jesus says. Tempted not to leave the tip after harried service? Leave it anyway. Tempted to let rip on anonymous feedback. Be merciful. Store up credit, and God, the great mathematician, will ensure that you will have mercy in your time of need. When we started our publishing business, with just 1 title, then 5, then, 10, too few to outsource all customer service (as we now do, of course), I personally sold books on Amazon, and often had to email to get negatives or neutrals removed. My success rate was amazing—as if the Universe, or God remembered all the times I was merciful, realising that mom and pop in their back bedroom wouldn’t be as efficient as Amazon, so why rate them that way. The mercy came back to me. The Beatitudes are true, objective statements of reality, whether we realise them or not. I agree about the Beatitudes being important. I have felt only studying them for an extended period of time is something I should do. The whole Sermon on the Mount grows in significance each time I read it. Our pastor has started a series on the Man, Christ- The Man nobody knows. Christ’s longest sermon recorded should be the heart of what we study as His followers. And it is a choice to live this way, because in our nature, it is not comfortable. Me too. And it is the wisest and happiest way to live–and what’s more, it’s true, though everything in our world shouts otherwise!